If you’ve ever worked in an office, then you’ve probably noticed that the fluorescent light bulbs above seem to always burn bright consistently. Eventually, they give up, but they definitely have a longer life than the incandescent bulbs of yesteryear. 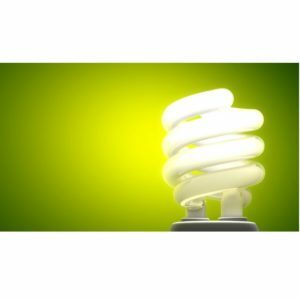 One big benefit to fluorescent lighting is that it doesn’t produce nearly as much heat as the old light bulbs, making them ideal for providing artificial light for plants. With all the different lighting available for gardeners and growers out there, fluorescent remains a popular choice. But why? Keep reading to find out all the answers to the questions you may have about CFL lights, and which is the best CFL grow light. What is a CFL Grow Light? 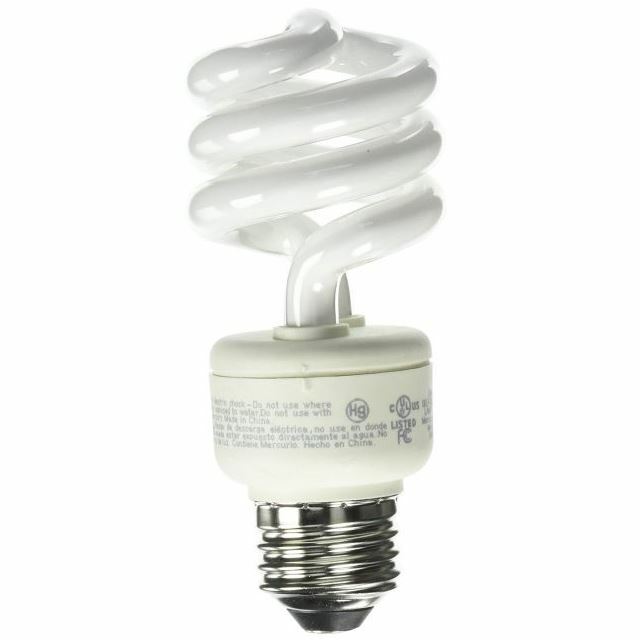 If you’re wondering what “CFL” stands for, it’s “compact fluorescent lighting.” To put it in simpler terms, it’s a fluorescent light bulb that fits in a standard light bulb socket. You see, when people learned how much more energy-efficient fluorescent lighting was, and that it produced similar light, without putting off as much heat, or using as much energy as an incandescent bulb, everyone wanted it. The problem was, you had to have the right system to use those tubes of light. At home, that was cost-prohibitive and wasn’t very practical. That’s how the CFL was born. 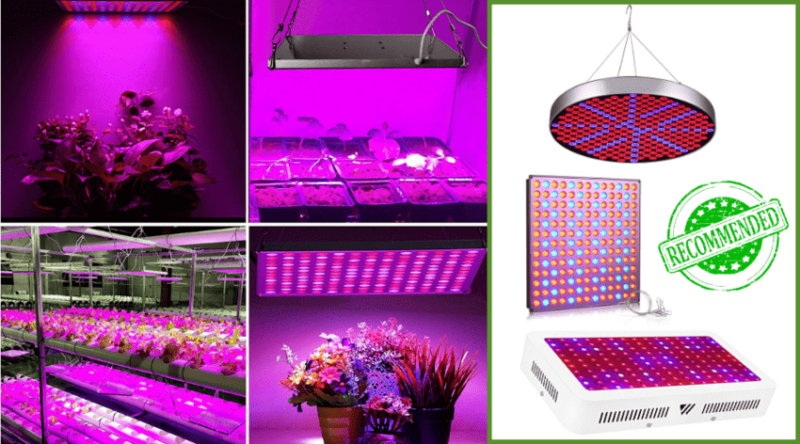 When gardeners and growers also realized how useful fluorescent lighting could be in providing artificial light for their indoor plants, they began to make the switch. It doesn’t matter what type of plant you’re growing because fluorescent is non-discriminating. The less output of heat meant they could let their plants grow tall and big, and close to the light without the edges of the leaves getting burned. It also meant their electric bills wouldn’t soar from using this light source. Yes, the upfront cost is slightly more than incandescent, but it’s much less expensive than LED. The lifespan of the bulb is a little shorter than the other choices, but they’re cheap enough to buy. The actual wattage used is much lower than that of incandescent bulbs, so you’re looking at energy savings of up to 80 percent. 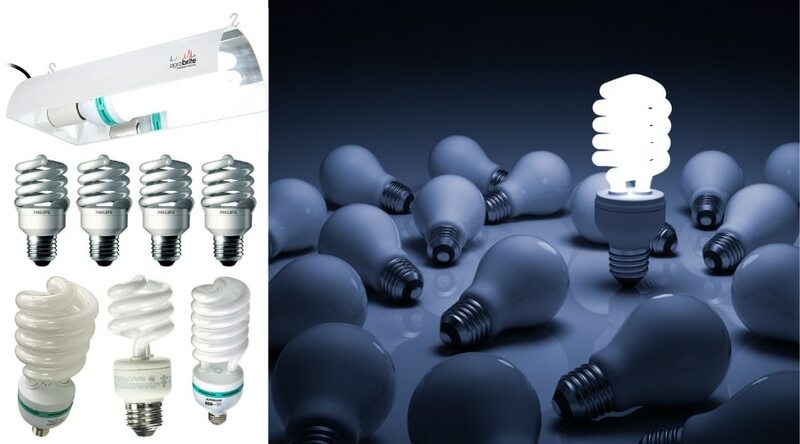 Once CFLs became more prevalent, you could easily buy them in stores everywhere, and online. It isn’t difficult to find these at all, unlike other light sources. And one of the biggest benefits is that these squiggly tubes of light fit in almost anywhere. One of the best arguments for using CFL light bulbs for growing indoor plants is that you don’t need to buy a fancy setup. If you have a regular lamp, you can screw in a standard CFL and it’ll work. You can buy other accessories to make a better setup, though, like splitters, which allows you to use more bulbs on one lamp. Thanks to the design of CFLs, you won’t need any special setup to get started, but you will need the basics. 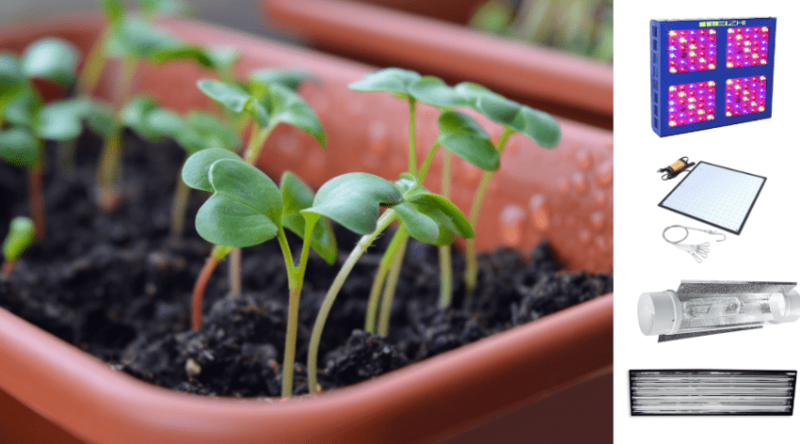 Regardless of what sort of plant you’re growing, you’re going to have to invest a bit in the startup supplies, but as each growth cycle completes and starts again, you’ll see your costs go down. Obviously, you’ll need to choose whether you’re going to grow your plants in soil or water. You’ll also need a vessel for those plants, so purchase the appropriate one. Next, you’ll need to choose a place for your indoor garden. It’s a good idea to choose a spot that’s free from other light sources, as you want to control the type of light your plants get. Don’t forget to get the right nutrients for your chosen crop, and you might want to get a pH kit, as well. Finally, get your seeds or seedlings ready. You might want to figure out a ventilation system to help the heat buildup dissipate. And a timer is a good investment; one that you can set up to the lights for automatically turning them on and off for the appropriate times. The real questions, though, are what type of CFL grow lights should you get? Is wattage or lumens more important? Is there a certain spectrum needed? It all comes down to what you’re growing, really. 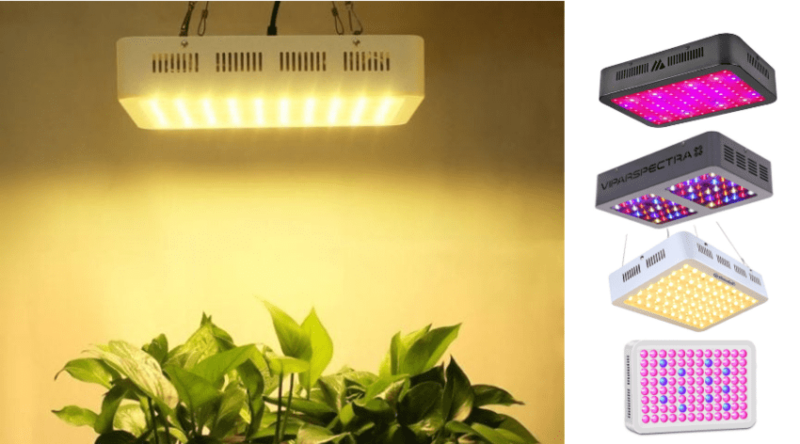 Many people are looking into grow lights for cannabis. You may have read that cannabis needs two different types of light for its vegetative stage and flower stage. It turns out that it doesn’t really matter whether you choose soft white CFLs or daylight CFLs. Many cannabis growers say the soft white CFLs offers enough of the spectrum of light to encourage the best growth in both stages. Most of them suggest you start with 42w soft white CFL bulbs for the whole process, depending on how many plants you’re growing. The more light and wattage, the better, at least for CFL lights. You’ll need several bulbs, though, because you want to try to reach about 150w of fluorescent light per plant. There are lamps out there with several sockets and flexible necks, which makes them ideal for indoor gardeners. You may want to consider purchasing some splitters, too, which allow you to screw in a couple of light bulbs instead of just one. This Apollo Horticulture 60W CFL grow light offers a bright, white light that’s ideal for indoor plants. The 6,500 Kelvin color spectrum can take your plants through its vegetative and flowering stages with no issues. While many CFL bulbs claim to be 60W, they could just be offering the incandescent equivalence, but Apollo’s is the real deal. That means this bulb has an equivalence of 250W, making this a bright, powerful light to help your plants grow. Although this is a powerhouse of a bulb, it doesn’t use up a ton of electricity, which is reassuring when you consider the cost of one light bulb. It’s pretty pricey, especially if you need more than one light bulb, but it’s much more cost-efficient in the long run. It’s a popular choice of bulb among growers, but there have been many reports of defective units. The good news is that this bulb comes with a 30-day money-back guarantee, so you can return a defective bulb and buy a different one. If you want a powerful, bright CFL grow light, and you don’t need too many, this one may work for you. 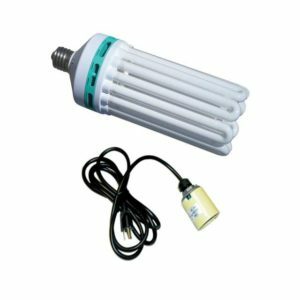 The greatest thing about this Hydroponic Full Spectrum CFL light bulb is that it is a bright light with that daylight spectrum, making this a great choice for all sorts of plants. Whether you’re bringing outside plants indoors for the winter, or you’re growing year-round inside, it gives enough light to help even stubborn plants grow tall. And tall may not be what you’re going for. This bulb is quite long and narrow, so plants may get a little leggy, but won’t spread out far enough. 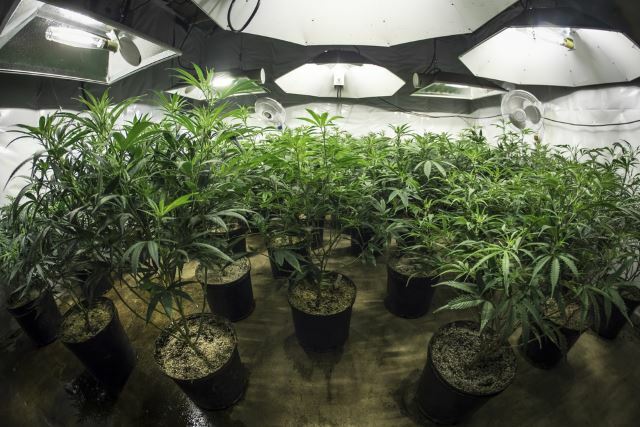 Part of the reason for that is that fluorescent light has a hard time penetrating to the bottom of the plant, and so your plant reaches upward. Like most CFLs, this grow light should last about 10,000 hours over its lifetime, which equates to about a year or more of continuous use. However, some people who reviewed this bulb said it lasted only days, weeks, or months. 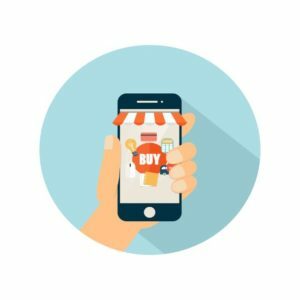 Sometimes it’s a hit or miss kind of thing, and defective units can be returned in the first 30 days after purchase. The actual wattage is 60W, which means it burns as bright as a 250W incandescent light bulb, but only uses 60 watts. Although fluorescent is supposed to burn cooler and not emit much heat, some users said it got too warm for their plants. If you need a CFL grow light that produces a bright, natural daylight, then this one might work for you. 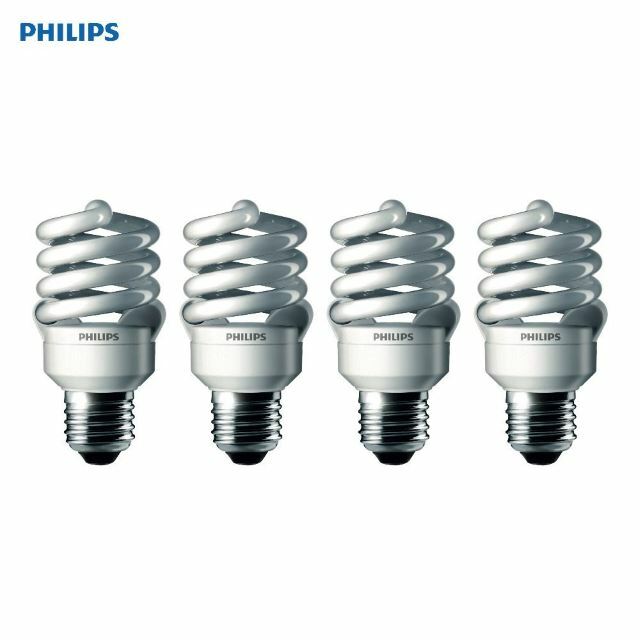 Plants that love that bright white daylight kind of light – and what plant doesn’t – is sure to lean in toward the Philips 433557 23W CFL light bulb. Perhaps the best thing about this bulb is that it comes in a four-pack and is more affordable than similar light bulbs. It promises the equivalence of a 100W incandescent bulb, but at only 23 actual watts. Also, these are small bulbs at about 4 inches long and only a couple inches in diameter. This makes it easy to place several of them on splitters and spread them out among your plants – from top to bottom. 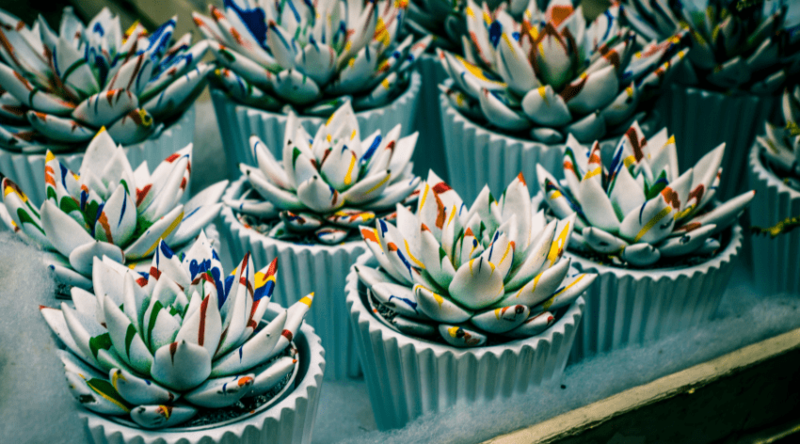 While these are like the other CFL bulbs out there – energy-efficient and long-lasting – these bulbs burn a little hotter than your indoor garden may tolerate. Of course, an easy fix is to move your lights up or your plants down, or provide your plants some cooling air conditioning or a fan to circulate the air. Each CFL bulb in this pack is supposed to give you up to 10,000 hours of life, but it may be shorter for those of you who need to keep this light on for 16 hours per day. If you need a pack of tiny CFL bulbs for your indoor plants, these could work well for you. 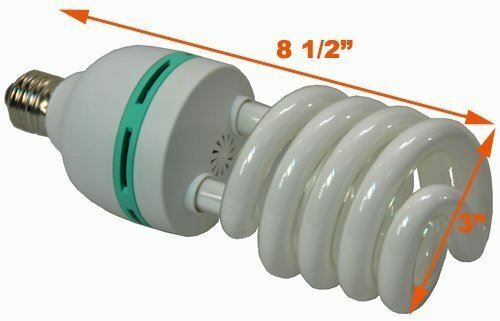 This value pack of EcoSmart 9W CFL light bulbs could be a good deal if you consider getting four tiny light bulbs for less the cost of one higher-wattage similar style CFL bulb. You are compromising in a few ways, though. One, this type of light is a soft white, which can be good for flowering some plants, but not so much for the vegetative stage. Also, the wattage is extremely low for this bulb, so you may need to use several bulbs for efficacy in your indoor garden. The energy use of these bulbs is excellent, as each one only uses 9 watts, but it gives you the equivalent light of a 40W bulb. EcoSmart claims the longevity of each bulb is about 10,000 hours, but many customers have noted that bulbs died out after a fraction of that time. These aren’t the brightest bulbs available, but soft white has its role in a plant’s life. If you’re in the market for a soft white light that doesn’t burn nearly as bright as some of the other CFL grow lights out there, this one may be right for you. 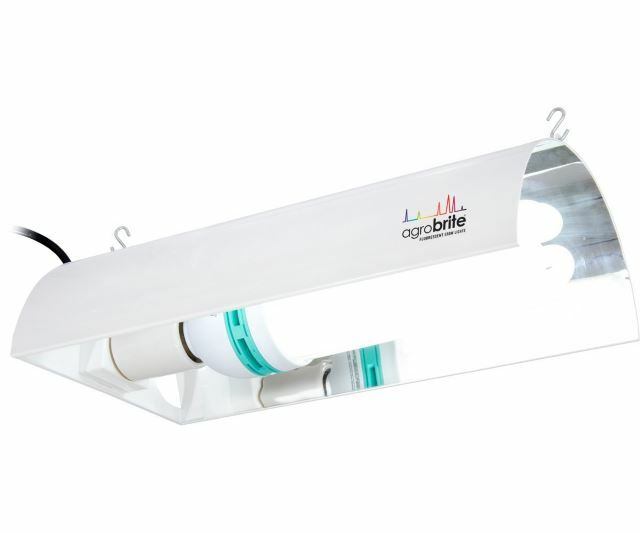 The Hydrofarm Agrobrite CFL system is a little different from the bulbs you typically see. 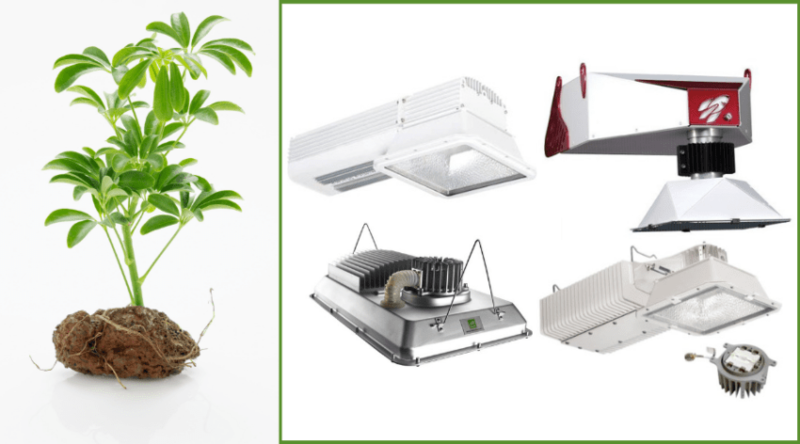 This is a whole compact lighting system that could be ideal for your indoor garden. The 18-inch ballast holds a 125W CFL grow light – yes, that’s 125 actual wattages. The incandescent equivalent is off the charts on some readers (somewhere around 450W, but probably higher). So, this lighting system is going to use a bit more energy, but it’s still more efficient than incandescent alternatives. The bright white light from this long CFL bulb is strong enough and effective enough to power a plant’s cycle from vegetative to flowering. The daylight spectrum is what plants typically crave, and this lighting system offers enough coverage for a medium-sized garden (think small to medium potted plants). The hood has a reflective surface inside which increases coverage. 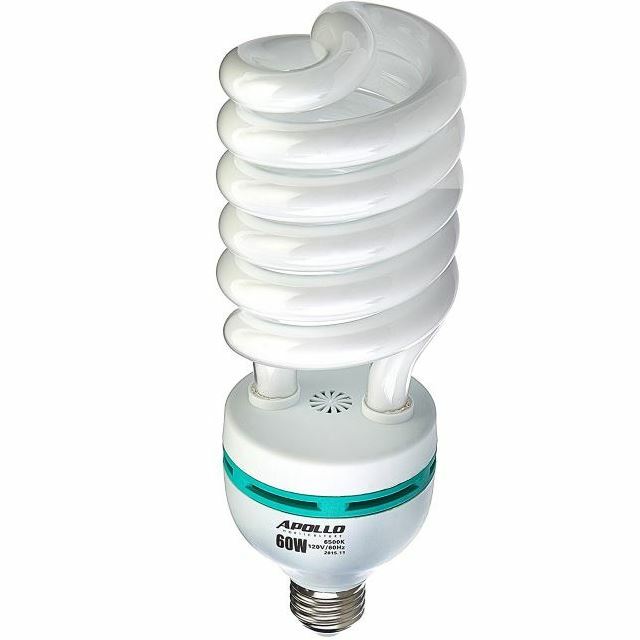 The defects and issues are very common compared with other CFLs, but with this one you get a one-year warranty, just in case. If you’re looking for something a little more heavy-duty in the CFL grow light arena, this might work for you. Your plants crave sunlight. However, you can’t always give them the best natural light because of changing weather, outdoor hazards, or other issues. So, artificial lighting is the next best thing. When you choose CFL grow lights, you’re investing in a long-lasting bulb that doesn’t use nearly the same amount of wattage as incandescent, but still puts out impressive lumens. While all of the bulbs above are excellent choices for different reasons, the one that seems to pull ahead of all the others is the Apollo Horticulture 60 Watt CFL Compact Fluorescent Grow Light Bulb for Plant Growing – 6500K. You get that bright, white daylight spectrum, which is as close to natural sunlight as you can get. 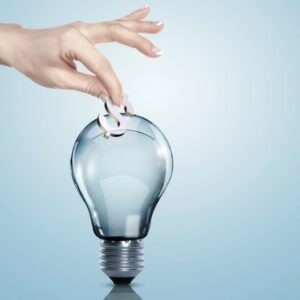 It uses a full 60 watts of energy, which sounds like a lot, but when you consider it’s the equivalent of a 250W incandescent light bulb, you can see how your energy savings will add up. Plants tend to love this light bulb, and though it’s a bit pricey, it has a long life, which means you won’t have to replace it all that often.